In order to standardize the unmanned aircraft engaged in operational flight activities and promote the safe, orderly and healthy development of the unmanned aircraft industry, the Civil Aviation Administration of China issued the Administrative Measures for the Operational Flight Activities of Civil Unmanned Aerial Vehicles (Interim) in June this year. ", under the framework of the Civil Aviation Law, regulate the access and regulatory requirements for unmanned aerial vehicles engaged in operational general aviation flight activities. In response to the call of the Civil Aviation Administration of China, Shandong Carter Intelligent Robot Co., Ltd., a subsidiary of China Transport Group, actively submitted relevant information. 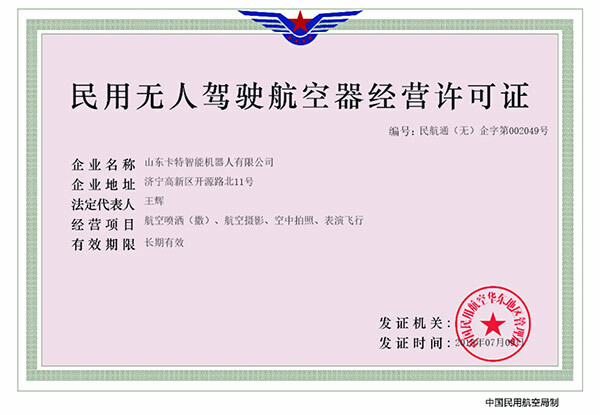 After strict review by relevant departments, our company successfully passed the audit and officially obtained the “civil use” issued by the China Civil Aviation Administration of East China. The unlicensed aircraft operating license" permits the operation of our unmanned aircraft business activities, allowing four types of business projects: "air spray (sprinkling), aerial photography, aerial photography, performance flight", and long-term effective. In recent years, China Transport Group has actively responded to the call of the state to vigorously develop smart industry, and invested in the establishment of Shandong Carter Robot Co., Ltd. Since its establishment, the company has adopted the global market as a guide and international brand as its purpose, relying on the Group's strong scientific and technological strength and professional technology. The R&D team and the huge sales team continuously increased the scientific research investment of high-tech UAV products. By introducing advanced technologies from Germany, the United States and Japan, we extracted the UAV production technology suitable for China, and independently developed and produced agricultural plant protection. Man-machines, aerial drones, patrol drones and other equipment have played a positive role in promoting the development of China's smart industry. The successful acquisition of the civil unmanned aerial vehicle operating license marks that our company is qualified to engage in drone operational flight activities, and is of great significance to the overall improvement of the core competitiveness of the company's drone products and to accelerate the expansion of the global product sales market. ! In the next step, we will actively respond to the call of the country, make persistent efforts, develop and innovate, increase the research and development of new products for drones, produce more high-quality, high-tech products, and actively build the leading brand in the domestic drone industry! Next: Congratulations On The Establishment Of China Transport (Yantai) Intelligent Technology Co., Ltd.